REPENTANCE FOR GRACE! : Ten-Thousand Tracts, One Day! What a day! It all started weeks earlier back home in Airdrie. 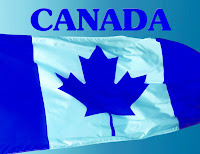 The idea germinated in my mind, to print a tract for Canada Day; something really Canadian. I was thinking of something with a Canadian Flag. What I came up with turned out much better than I imagined. We ended up with an 8.5 x 11 glossy, full-color piece. The front reads “Canada” and has a large photo of a Canadian Flag waving in the wind. The back contains a Gospel message in both English and French. By Gospel tract standards, the message is very complete. It’s always a challenge with Gospel tracts; providing as much information about the Gospel as possible while maintaining the readability. When someone reads a Gospel tract, questions arise. To assist in answering questions my friend Denis volunteered to create an accompanying website. The site allowed me to write an expanded Gospel message and with Denis’ help, provide some answers to questions as to the reliability of scripture and others. Check out the site at www.greatnewscanada.com. Click on the email link at the bottom and send your comments or suggestions. With 20,000 printed, I made plans for distribution. My wife and I were planning to be in the Montreal area the week over Canada Day. We decided to drive to Ottawa and hand them up on Parliament Hill. I contacted numerous people interested in spreading the Gospel of Jesus Christ in the Calgary area and a number of them agreed to help pass them out in both Airdrie and Calgary. Canada Day found Sue and I on Parliament Hill, jointed by Christian (from Quebec) and Pascal from Livingwaters Canada. Handing out Canadian Flags on Canada Day turned out to be relatively easy. Arriving on the Hill, we began handing them out, even the kids got into the game. We all had fun. At one point, I perched myself at the entrance to the Parliament grounds, right in front of the RCMP security checkpoint. I was calling to people “one each”. I handed out 1000 or so in an hour. All day we handed out some 4000 tracts.Back home in Alberta, my parents and a bunch of volunteers passed out about another 6000 (maybe more). Sitting down that night back in Sue’s parents’ home outside of Montreal, we realized that because of this effort, 10,000 Canadians that very day had the chance to learn of their sin, God’s righteous high standard and the coming judgment. They’ve the chance to learn of Christ dying on the Cross of Calvary as payment for sin; of repentance and faith. Pray for those that have received the tracts; pray for the Holy Spirit to reveal the truth of its message to them. Using experience from creating business flyers, we were able to create these tracts very economically, though we did print 20,000 of them. Including the website, the investment was significant. We have willingly funded this project ourselves. If you are able, consider contributing to the cost. Several people already have and this simply helps to print and purchase more tracts and our efforts to spread the Gospel of Jesus Christ to a dying world.